Colonel Bird’s Bath is the focal point of the Dell. It was built in approximately 1811 by Colonel Christopher Bird, Deputy Colonial Secretary. He built this bird-shaped pool (a play on his name) to collect the spring water, and let it stand and clarify before being piped to the house. It is made of Batavian-type bricks and is fed by four crystal-clear, ice-cold springs. 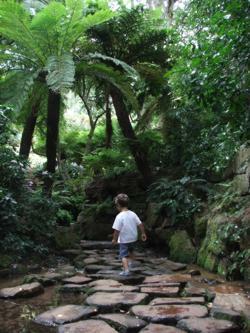 The paths and bath surroundings have been paved and cobbled in local stone by Kirstenbosch stone masons. This bath is also known as ‘Lady Anne Barnard’s Bath’, but that legend is not true. Lady Anne was the wife of the Colonial Secretary and lived at the Cape from 1797 until 1802. She could not have bathed in this bath as it was built after she left the Cape. The water that feeds the Bath flows from an underground spring at an average of 72 litres per minute, all year round. It is clean and pure, neutral (pH 7), and good to drink. The overflow, known as the bath stream, runs through the Dell and feeds a number of pools in the Dell as well as the Otter Pond, the Main Pond and the pond beside the restaurant. The spring is fed by the Table Mountain aquifer and its flow is probably controlled by the large fault that runs up Skeleton Gorge. Hand-axes and other stone tools have been found in the Dell, which tells us that the spring has been used for thousands of years. Growing beside the bath are a number of Dicksonia antarctica (tree ferns), two magnificent Ilex mitis (African holly) and around the Bath are shade-loving plants such as Clivia miniata (bush lily), Scadoxus multiflorus subsp. katharinae (fireball lily) and Asparagus densiflorus (emerald fern).